Posted on 11/7/2011, 12:19 pm, by sweets4ever, under Project Tutorials. 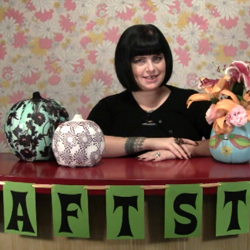 In this episode of Craftster Quickies, kittykill shows you how to take the foam pumpkins you used for Halloween and make them the star of your fall table! With just some paint, napkins, and maybe even some glitter, you can give new life to those faux pumpkins! You look like you’re having a lot of fun! I like the fabrics you used.